The cast of Peter Pan in Scarlet at New vic, Newcastle-under-Lyme. Photo: Geraint Lewis. New Vic artistic director Theresa Heskins has never been one to opt for the easy life. His ingenious previous productions of Around the World in 80 Days and The Borrowers at the North Staffordshire theatre-in-the-round are proof of that. She’s clearly relished the chance to stage this complex sequel to JM Barrie’s Peter Pan. Her trademark ability to make the seemingly impossible possible is stamped firmly across this adaptation of Geraldine McCaughrean’s 2006 book. A set of garden swings transforms into a wave-tossed sailing ship and much of the action takes place with cast members expertly spinning and swaying mid-air in a series of silks. 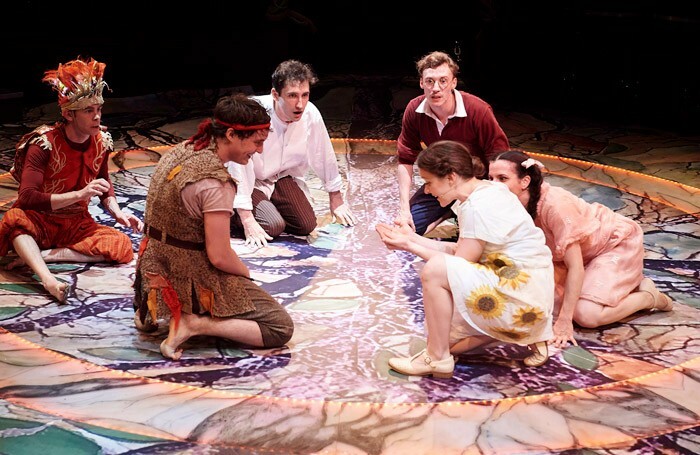 But the clever set-pieces can’t hide the fact that the story is a somewhat jumbled collection of ideas about what Peter and co are up to some 20 years after their original adventures in Neverland. There are hints of First World War devastation, the loss of childhood and innocence, but the narrative becomes rather hazy. Still, it’s enjoyable on a more superficial level, with the multi-talented cast acting and playing musical instruments before getting back on the silks. Isaac Stanmore plays the new-look, often angry Peter with plenty of passion, while New Vic regular Michael. Hugo provides the comic turns as Fireflyer. Rebecca Killick, who has a fine singing voice, makes a perfect Wendy and Andrew Pollard’s Hook has such impressive diction that his every word can be heard, even in this tricky space.